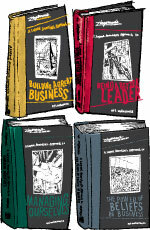 Zingerman's Guide to Good Leading Books: Complete Set for sale. Buy online at Zingerman's Mail Order. Gourmet Gifts. Food Gifts. The complete series by Zingerman's Co-Founder, Ari Weinzweig. Zingerman's co-founder Ari Weinzweig is a prolific writer. In his career he's written about great food, great service, and even great bacon. He's also written a phenomenal series on how to run a great business. This collection of the four books in the "Lapsed Anarchist" series of business books includes dozens of "secrets" that have helped take have helped take Zingerman's from a 25-seat, 4-person start up to a nationally known, $60,000,000-organization employing over 700 people. The secrets include topics ranging from servant leadership, open book management, mindfulness, writing a vision of greatness, and plenty more. The experiences are compiled into bite size, easy to digest lessons you can read section by section.